Nicole Cherubini‘s Althean, from 2015, is a work of monumentality whose spiritual arcs transcend the histories of sculpture and civilization. I had to look up the word “Althean” and I discovered that it is the adjective form of “Althea”, a Greek name believed to have been derived from an ancient deity, or perhaps a reference to the Grateful Dead song. The meaning is likely a reference to the Greek pottery of the ancients and the sacred traditions that operated within the manufacturing of Greek architecture and sculpture. 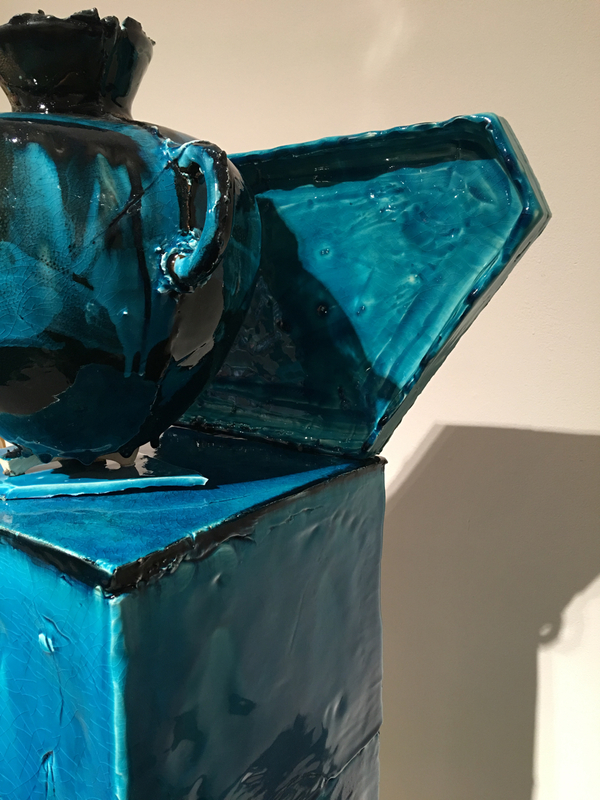 The striking crystalline blue glaze employed in the majority of the sculpture by Ms. Cherubini is perhaps another allusion to ancient Greece with its sea-like blue-green hues. What makes the work monumental is not its size (It measures approximately six feet in height and never gets wider than 18 inches by my estimate). The monumentality the viewer is presented with in Althean arises from the verticality of the form and the sense of the sacred surrounding its objects and their positioning within the composition. What makes Althein resonant is its composition of disparate items joined in block form to create a tower or sculptural base upon which sits an amphorae-like ceramic work with a curious tray-like ceramic backing. 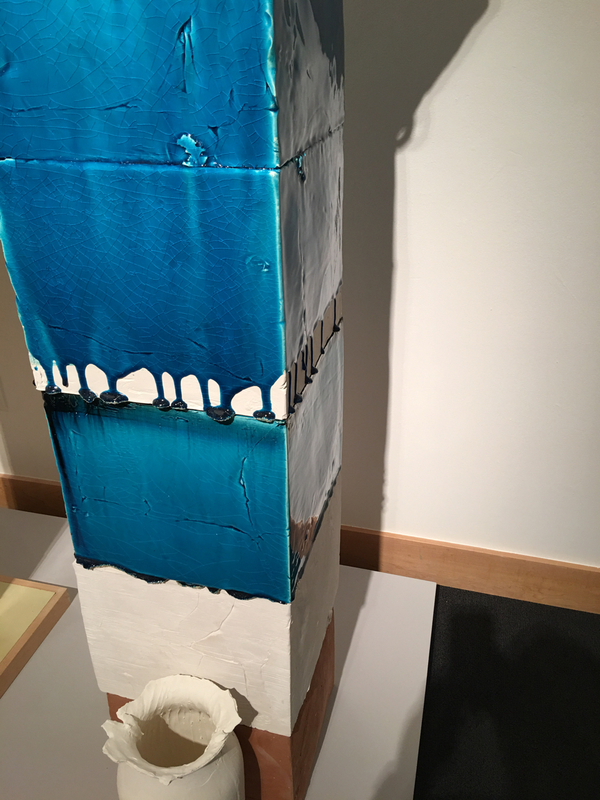 At the foot of the column and directly in front of it is a plain un-glazed vase serving as a rich and subtle visual counter-balance to the decadent opulence of the dripping blue krackling surface that adorns and attacks the majority of the sculpture above. The column elements vary in material from MDF to earthenware and fiber board. I can imagine the work existing as some form of totem in a fantastical jungle populated by ancient wealthy women living in Boca Raton or Los Angeles, marking their territory after the apocalypse with the quasi luxurious and mystical artifact 1,000 years into the future. The ostentatious, if not downright lurid, flow of blue glaze dripping and forming goops along many of the blocks and crudely painted on the vessel alludes to some sort of painterly aspiration on Ms. Cherubini’s behalf and serves as a reminder that Greek sculpture and architecture was once painted in brilliant colors. 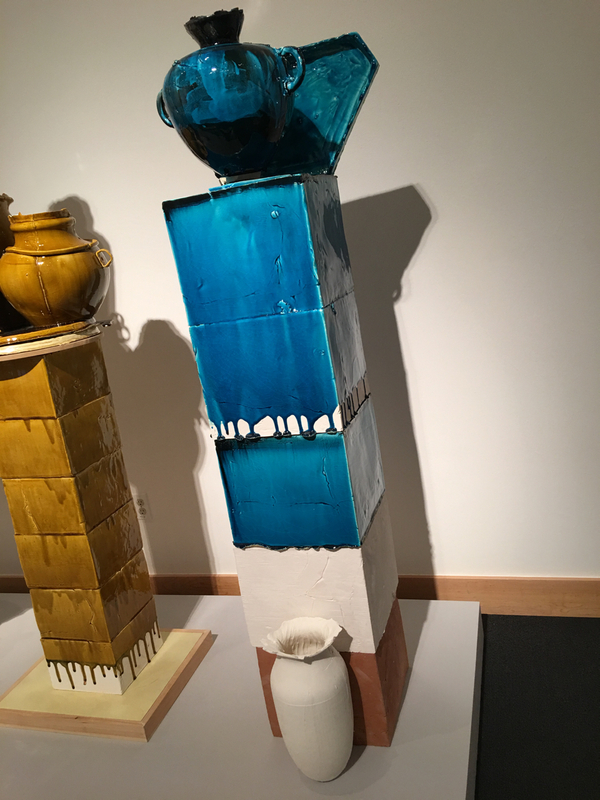 Part of the “Regarding George Ohr: Contemporary Ceramics in the Spirit of the Mad Potter” exhibition at the Boca Raton Museum of Art, Althean is the stand-out work that defies the casual forays into kitsch, schlock and concentrated ugliness many contemporary ceramic artists are afflicted with. Ms. Cherubini’s sculpture is a work of allegorical philosophy through ceramics, one that addresses the ancient pottery of the Greeks and the totemic “Endless Column” of Constantin Brancusi in one breath of playful and studied genius. Althean is a memorable and arresting work that takes ceramics to its conceptual limits while honoring the various divergent traditions of sculpture’s mindcraft. This mindcraft emerges from the flow of the basics of handicraft present in its purest and most provocative displays in a work of sumptuous sculptural eroticism.